I have a confession. I'm a sucker for anything that has a surprise built into it. Think James Bond's cars and watches, there was always something neat tucked away to get him through a bind or even just to give him the advantage. I know it's a long bow to draw but it's the same with the cool storage solutions we see in kitchens these days. Anything that pops up, sweeps open, swooshes up or spins around to reveal some cool hidden storage just gets my heart racing. It's nerdy I know. One of the very first things you should consider when designing a kitchen is what you need to store within the space. Create a checklist of what you already have and then allow 15-20% extra to allow for future purchases. This will not only ensure you have a place for everything but it will also allow you to decide when to use drawers and when cupboards may be more suitable. For example, deep drawers ensure that everything is visible and reachable however may not be suitable for larger appliances. Soft closing and touch catch options from Freedom Kitchens ensures that your drawers and doors are both stylish and functional. Consider an island bench as they offer up an ideal configuration for entertaining as well as storage. Choose from a variety of design options to suit your space, needs and style. Love to entertain? Introduce an overhang for dining with space for stools at the front or sides and add storage at the back of the island. Alternatively you can choose to design the back with deep storage and leave the front as a feature or double up with storage on both sides. You may also like to consider introducing wine fridges, wine racks, and appliances such as dishwashers and/or microwaves to your island bench to create more storage space on your back benches. Whether built-in, butler's, walk-in, or a combination; a well-conceived and designed pantry can transform the way that you organise and use your kitchen. If space allows a walk-in or butler's pantry concealed from the main kitchen space not only provides extra storage space but also provides an excellent solution to hiding mess in the kitchen when entertaining- you can simply close the door when your guests arrive and enjoy your hosting duties. Tight on space? Opt for a pull out pantry (pictured above) with adjustable shelving to store all your necessities. I also like to customise my own by adding in drawers inside cupboards, which allows you to access separate groups of pantry inclusions one at a time rather that exposing your whole pantry every time you need to get a jar, packet or can. 3. Hard to reach areas- solved! Gone are the days where those tricky corner cupboards are dead space. One of my favourite space savers is Hettich's Le Man Blind Corner Shelf System. 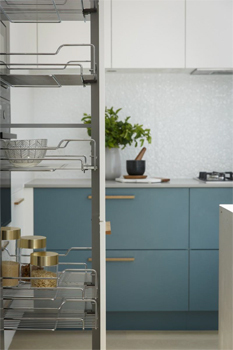 Made up of two kidney shaped shelves which can hold up to 20 kilograms of items each, this system transforms a full cabinet depth void into a highly functional space, perfect for storing essentials like pots and pans in an otherwise blind corner. Find a place for everything with the extensive range of internal organisers from Freedom Kitchens. 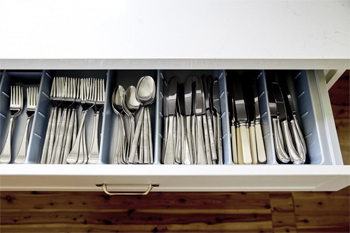 Adjustable drawer dividers for cutlery and kitchen utensils mean that these essential items can easily be stored and found. Furthermore, spice drawers and rack, knife holders, towel rails and base units stored within drawers or cupboards will also allow you to optimise your kitchen space with everything within easy reach. Remember every single void area is an opportunity for storage. Kitchens are made more functional, effective, efficient and even beautiful by specifying a higher level of internal fittings – not to mention they're made much cooler by giving your kitchen that extra -James Bond' gadget factor. Ultimately my best piece of advice is to call in the professionals – Freedom Kitchens' designers are experts in this area and can provide you with solutions that you may never have considered. Begin your kitchen journey today. 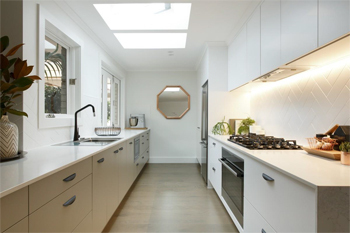 To book a free in-home design appointment with a professional Freedom Kitchens designer, visit freedomkitchens.com.au or call 1800 113 733.